If you're not familiar with the world of Instagram shops you're missing out. You can find great deals on gently used clothing for all ages and you can't beat the prices (or the fact you can shop in your pajamas). A few months ago I came across @hstwinshop and purchased a few pairs of shoes for Jude & Sloane. The shoes arrived in perfect condition and since then I've kept up with Promise, the shop's sweet owner. Promise is a fellow twin mom who sells her children's clothes and now has her very own Etsy shop filled with adorable rompers. If you follow Amber (@masseya) and me (@meredith_haynes) on Instagram you saw some pictures last Friday of Jolie, Parker, and Sloane sporting their very own rompers made by Promise. They are well-made, comfortable, and PRECIOUS. She makes the rompers to fit loosely (harem pant style), with adjustable straps to ensure they can be worn for a long time. In the pictures below, Sloane is wearing size 18-24 months and Jolie & Parker are wearing 12-18 months. 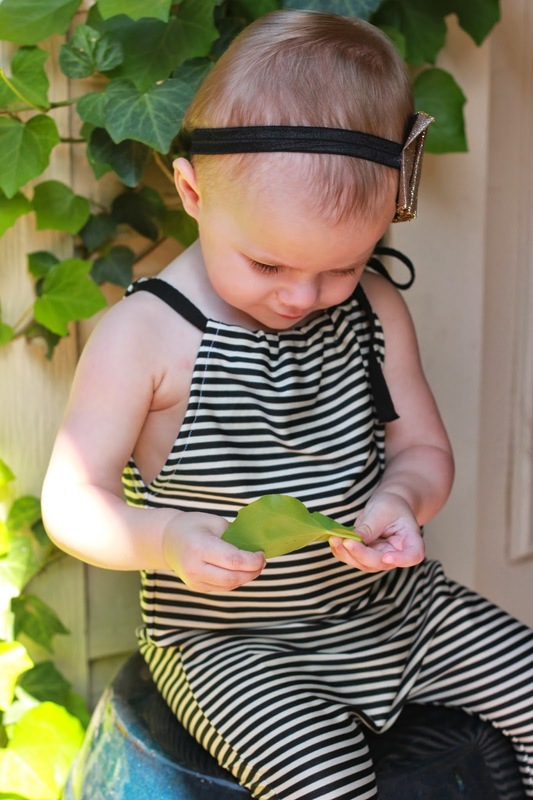 These rompers are perfect for the upcoming summer months as the fabrics are lightweight. They are also perfect for our next giveaway, which begins TODAY! We are giving away a romper to one lucky winner, unless that winner happens to have twin girls, in which case we are giving away two rompers! Hi! My name is Promise and I'm the owner of HStwinshop. We make handcrafted nursery items, baby and toddler clothing. I recently launched my Etsy store after working through Instagram, where I have met so many wonderful moms who have started their own businesses. And now through Twin Talk, I've met Amber and Meredith as well. I began my store as a creative outlet and a way to express my love of fashion and crafting. I am a mom of four, including my twins Sophia and Hudson, who are 18 months old. I am an Air Force wife and this summer we will be relocating to Louisiana. I am so excited to get back to the south. I am a Dallas girl at heart. I'm looking forward to reading your stories and feedback on the blog and I really hope you all come visit our shop. 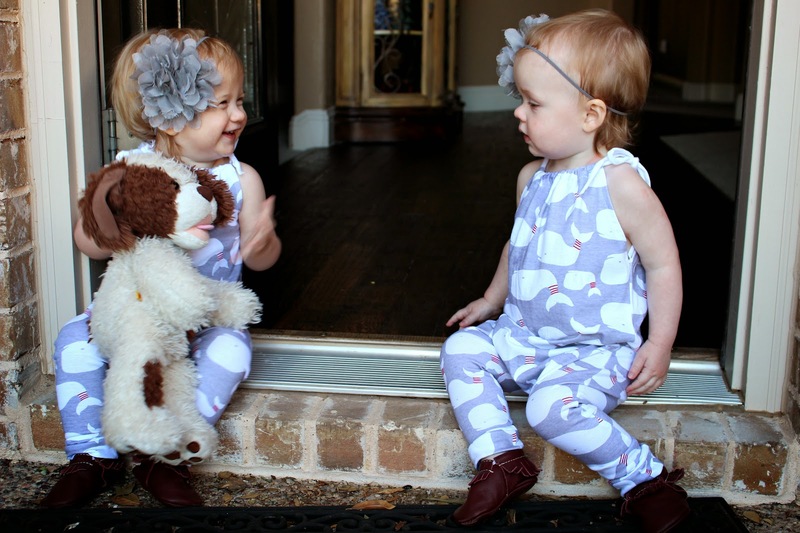 Enter below to win one (or two if you have twin girls) romper! Say what? If you are a mom of boys, this giveaway would be a great shower/birthday gift for a friend! There are several ways to enter and we hope you'll take advantage of all of them! Contest ends this Friday, May 9 at midnight. Check out Promise's Etsy store and follow her on Instagram (@hstwinshop). The winner will be announced Monday, May 12! Would love these for my twin girls - so sweet! I would love to win these for Eleah & Elayna!!! These are too cute!! Love these rompers! B/G twins here, but my lil Tenley would look adorable in one!! ADORABLE rompers!! Would love to win for my g/g twins Audrie & Markie! Love the pink baby whale print romper- too cute! I love these rompers. So cute! So darling! I will be checking out the Etsy shop! So stinkin cute. I have to have one. The fringe is super cute. So cute! Wish I had a daughter but my niece would look super cute in one! So adorable! I want matching ones for my twin girls! SO STINKIN' ADORABLE!! If I could pull this outfit cuteness off as an adult... I so would! I LOVE the whales! I don't have twins, but my daughter has a cousin that's a month older. I would love to have them in matching rompers! Half the time they look like twins! Would love to win these adorable rompers for my twin girls that will be arriving in EIGHT DAYS!!! Love everything!!!!!!! My twin girls would love these! My twin girls turn one on May 15th! What a great first birthday gift this would be! Would love to win a set of these for my girls B & H! Your rompers are adorable! My twin girls are due in just a couple weeks! I'd love to add these to their wardrobe! Your rompers are adorable! My twin girls are due in just a couple weeks and I'd love to add these to their wardrobe! Those rompers are so so adorable! My twins Myla & Nora would love to wear these! I love to have these for my girls, Oliviana & Everly! SO adorable! 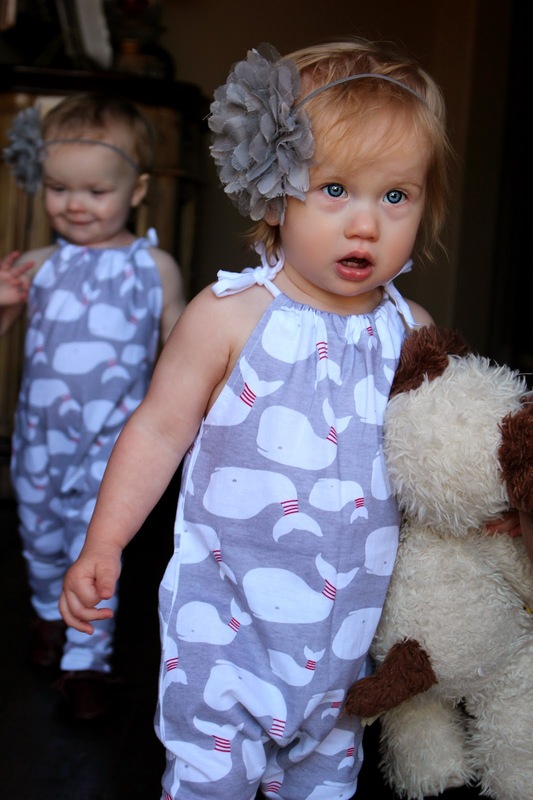 I would "whaley" love the whale rompers (in pink and grey) for my twin girls Taylor and Madison - they are too adorable! Thanks for sharing! Love the black and white stripe!! Love the rompers! I have twin girls that would look adorable in them! I'm expecting twin girls and love the Grey Baby and pink Whale Print Harem Style Romper-so cute!